Summary: If you're after a gaming ultrabook that weighs just around 3 pounds, looks astonishing and packs top features in a sleek and compact body, the Asus Zenbook UX303LN should definitely be at the top of your list. Ultrabooks are sleek and snappy, but graphics performances are not exactly their strong point. 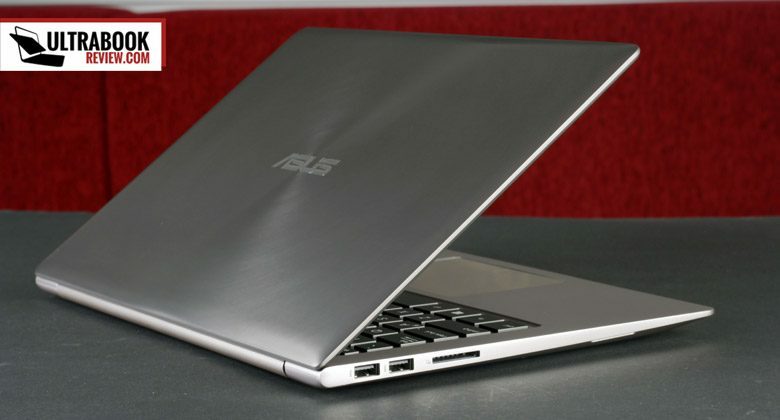 However, if you were looking for a 13 inch ultrabook with dedicated graphics in the last years, Asus got you cover, with devices like the Zenbook UX32VD back in 2012, the Zenbook UX302LG in 2013 or the more recently launched, but scarcely available Zenbook UX32LN. Their latest addition to this series is called the Asus Zenbook UX303LN and it’s going to be the most powerful 13 inch Zenbook for 2014 and early 2015. 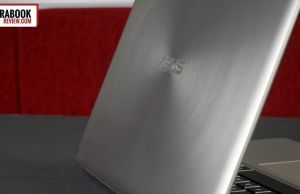 It pretty much builds on the same recipe as its predecessors: a slim and light metallic body, top features, fast hardware and more powerful graphics than were ever before squeezed on an ultrabook in this class. But is the end product any good? Well, spoiler alert… it definitely is, and you’ll find out what too expect from this Zenbook UX303 from this thorough review. As a heads-up, you should know that I am reviewing an pre-production unit offered by Asus and I’ve used it as my main driver for the last 10 days. This model is nearly identical to the retail versions you will find in stores, but it has a few issues which hopefully will get fixed by the time you’ll be able to buy your own units. I’ll tell you more about those in the rows below. 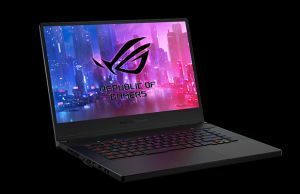 Update: There are newer versions of this laptop available in stores, the Zenbook UX303LB (with Broadwell hardware and Nvidia 940M graphics) and the Zenbook UX303UB (with Skylake hardware and Nvidia 940M graphics). A UX303LA version of this laptop, without the dedicated graphics but mostly identical otherwise, is also available, with price starting at around $700. See this post that compares the UX303LA with the UX303LN for more details. Update: As of early 2015, there’s also a Broadwell version of the UX303LN which bundles the Core i7-5500U processor. However, given how the i7-5500U is not a lot faster than the i7-4510U CPU, as you can see from here, the two will be pretty much on par in most chores. 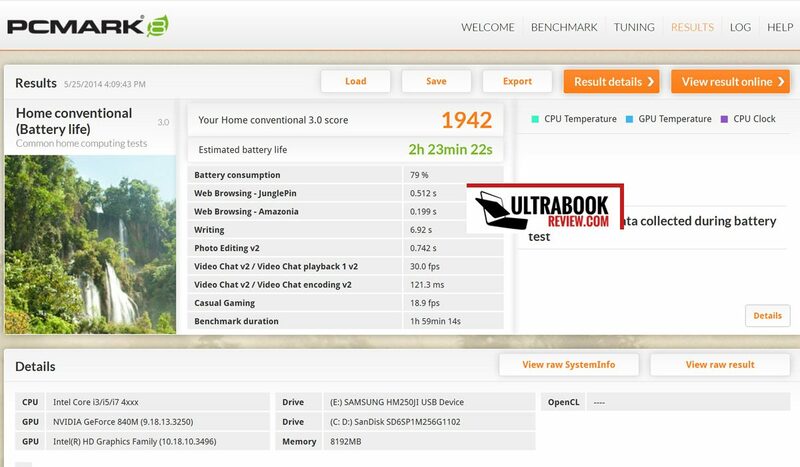 Update2: As of late-2015 however Asus launched the Zenbook UX303UB, with the Core i7-6500U processor and Nvidia 940M graphics chip. You can read all about it in this post. It still retails for around $1300, but a 512 GB SSD is included for that kind of money, at least in the US. Follow this link for the latest configurations and potential deals. Let’s take a step back and have a proper look at this Zenbook. The UX303LN is truly beautiful. The moment I got it out of the box I was like: Hmmm, this feels different. And it does, although it might not seem so from these pictures. Design wise, the Zenbook UX303 LN borrows most of its lines from the 2012 Asus lines and not from the redesigned 2013 models, with their new screen hinge and glass covered cases. And that’s a decision I salute, firstly, because I was never a fan of the fingerprint magnet Gorilla Glass coating, and second, because the cooling implementation is actually better on this approach, as you’ll find out a bit later. 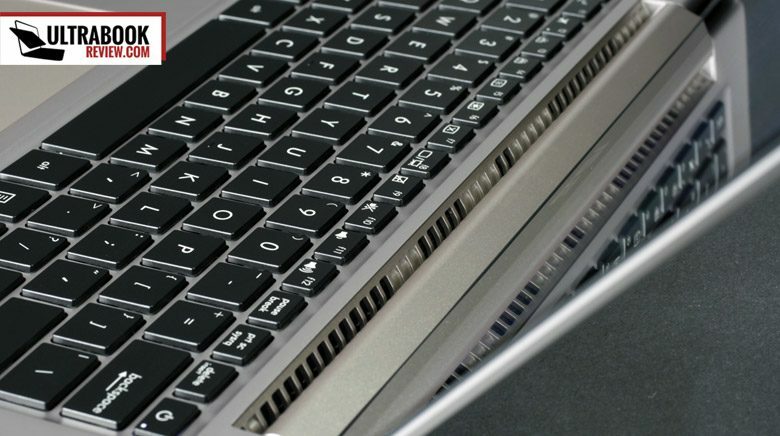 The entire laptop is made out of aluminum, feels solid and somehow more carefully put together than before. There are no miss-aligned elements and there’s an attention to details you would actually expect from a premium device. The lid and the interior&sides are each carved from block of aluminum, while a sheet of metal covers the belly, which is now thicker and more rigid than on the older Zenbooks, so the laptop won’t squeak anymore when grabbed. 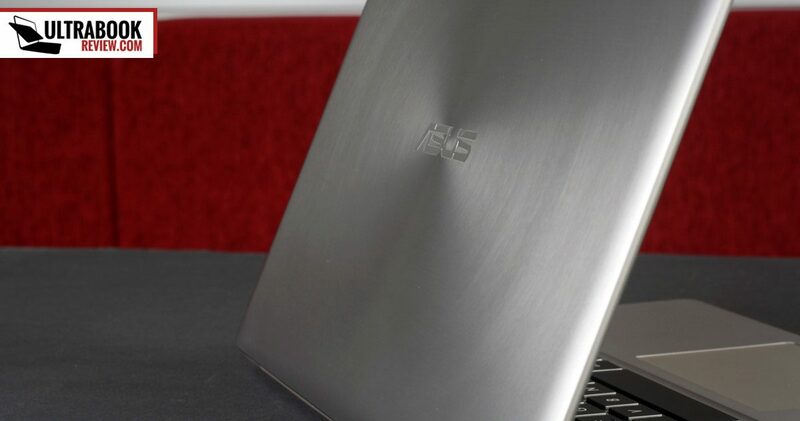 Update: Keep in mind that this laptop will be available in what Asus calls “Smoky Brown”. That’s some sort of mix between Light Brown and Silver, but in my pictures the laptop might look a bit more grayish than it is in real-life. Aesthetically, the UX303LN looks pretty much like we’d expect from a Zenbook. 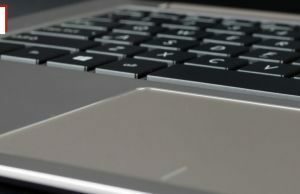 The concentric circles pattern on the lid cover is still present on this one, but is more subtle, somewhat toned down (and easier to wipe clean of smudges), while the brushed aluminum that used to cover the palm-rest on the older Zenbooks was ditched for a smoother, softer finishing, with a barely visible and almost indistinguishable texture. All these tiny changes might not mean much on a first look, but imh just give this new Zenbook a more refined aspect. 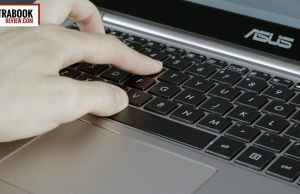 There are still some design decisions that I don’t agree with, like the cooling grid hidden behind the screen’s hinge, which pushes hot air towards the display, and indirectly towards the user, the Power button integrated within the keyboard, as the top-right button, or the tall and sharp front-lip which aggressively cuts into my wrist when using the trackpad or the arrow keys. But I can learn to live with these. 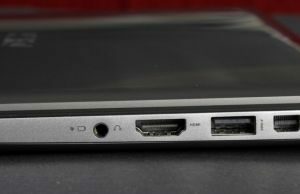 On a more practical aspect, I do like the solid selection of ports on the UX303LN sides, with 3 USB 3.0 slots, full size HDMI, mini-DisplayPort, a card-reader (which still can’t entirely fit an SD card) and some adapters in the pack (USB to LAN and mini-DP to VGA). I also appreciate this laptop’s balance, as the screen can be easily lift up with a single hand, while the body will remain flat on the desk. Update: Many buyers report that the hinge is not reliable and it will break in about 6 months of use and when that’s going to happen, you won’t be able to open or close the lid anymore. This is covered by warranty, but it’s an annoying hassle you need to be aware of. See these user reviews here for more details. Anyway, while the UX303LN has denounced the design lines of its predecessor, the UX302LG, it inherits its keyboard and touchpad. A fairly good keyboard I should say, with some flex in the middle, but nice feeling and proper sized square keys. They don’t offer a lot of travel, so you’ll need some time to get used to this keyboard, but are stiff enough to register commands even when pressed on the sides. On top of that, I do like the classic layout, with the exception of the Power Button placed in the top-right corner, which you will end up hitting a lot when looking for Delete. 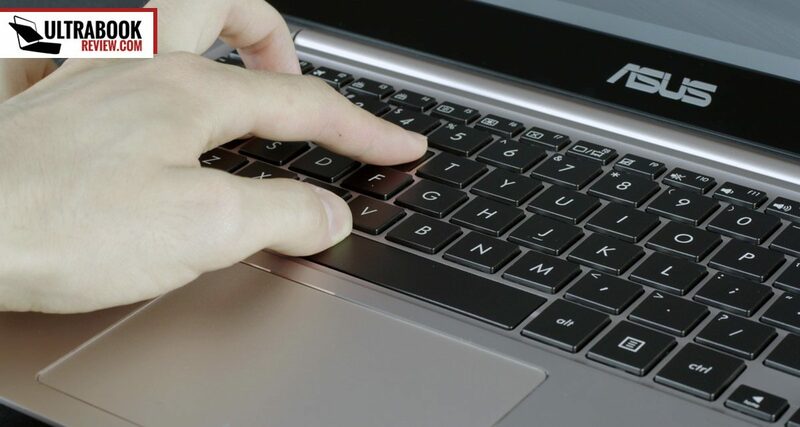 And while it is stiffer than the other keys, thus harder to activate, it still turns OFF the laptop, no question asked, when pressed by mistake. The keyboard is of course backlit, and you can manually adjust the brightness (3 different levels, plus OFF) by hitting the FN + F3/F4 keys. 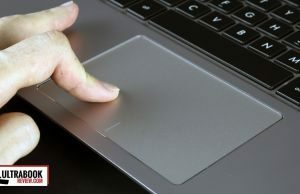 The TouchPad is large and nicely separated from the palm-rest by its beveled edges. Its glass surface doesn’t offer a lot of friction, but it is precise and responsive, both when performing casual taps or gestures. The entire pad is clickable, but clicks are a bit stiff and noisy, so you’ll probably end up taping it more often than actually performing physical clicks. As a side not, the older Zenbooks were crippled by some jumpy and erratic touchpads, but this one of the UX303LN is nothing of that sort. In fact, i’d call it docile and accurate. All in all, there’s not a lot to complaint about the keyboard and touchpad. You’ll find better on some devices, but these are definitely not bad either. 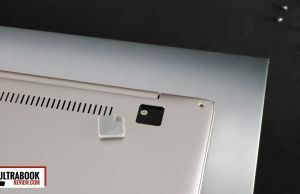 The new Zenbook sports the same 13.3 inch 3200 x 1800 px IPS touchscreen we’ve seen on the Lenovo Yoga 2 Pro (hardware ID SDC424A), a controversial panel. It’s sharp and given Windows 8.1’s scaling improvements, most elements are going to look great on it, but you’ll still encounter a fair share of rogue third party software that will display tiny fonts and buttons. I’ve been keeping this at native resolution with fonts scaled to 200%, so in other words, as a glorified 1600 x 900 px screen, which is actually a pleasure to use, as long as the software keeps up to pace. setting it up to any lower resolution will result in fuzzy and unusable fonts though. The panel is also fairly bright, has wide viewing angles and very little light bleeding around the edges, even on dark backgrounds. But the colors are way OFF, especially yellows (but not just), which have a Mustard like-tint. You can see the picture below for more details, where I had this laptop side by side with the iPad Air. Blue is the only fairly accurate color, and as a result, everything looks highly over-saturated. However, there’s clearly a calibration problem on this particular unit, one that Asus will hopefully fix on the final retail units. Lenovo and Samsung had similar issues with their Yoga 2 Pro and ATIV Book 9 Plus ultrabooks and managed to partially address them with BIOS updates, so hopefully Asus will do the same. As a side note though, I simply cannot understand the logic behind this high resolution panel on a gaming laptop. Scaling issues alone, this is clearly an overkill. It’s not like the hardware allows you to run games at 1800p anyway. On top of that, some games offer pixel per pixel mapping, which means that they’ll run in small windows in the middle of the screen if you lower the resolution in-game only, and not in Windows. That’s annoying. Long story short, I do hope Asus will offer the UX303LN with a standard Full HD IPS panel as well. That should solve the scaling and colors issues, with potential positive effects on both the battery life and the final retail price. On top of that, they really have to fix the calibration issues of the QWHD panel, which will be for sure part of the top configurations. 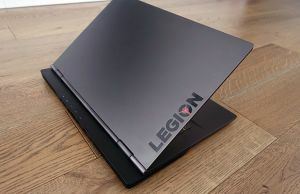 Hardware wise, I do have probably the beefiest configuration that’s going to be available for the Zenbook UX303LN here, with the updated Intel Haswell Core i7-4510U processor, 12 GB of RAM and a 256 GB SSD, plus the dedicated Nvidia 840M graphics. So no wonder the UX303LN flies in anything you might throw at it, from basic tasks to games and multimedia content. 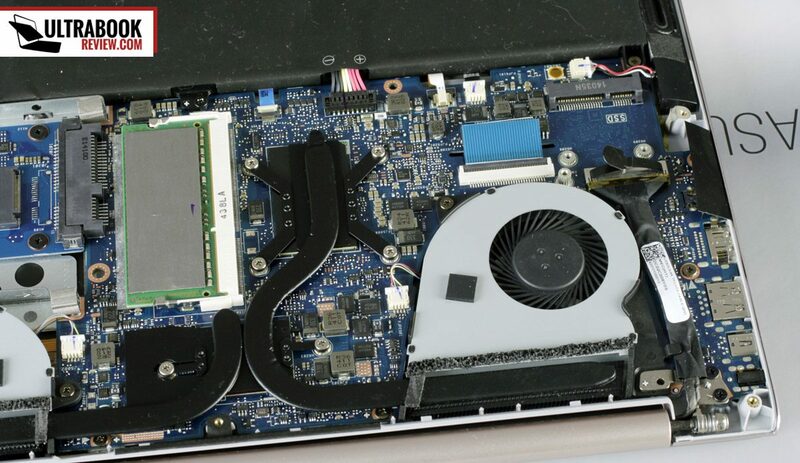 This laptop is partially upgradeable as well. The back plate is hold in place by a handful of Torx screws (T5) and with the right tools, is fairly easy to take apart. There are two P20 screws behind the rear rubber feet and you’ll need to peel those OFF to get to them. 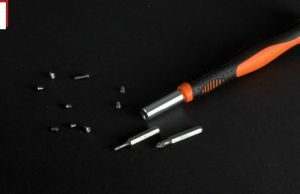 A flat screwdriver will come in handy, just be careful not to scratch the metal. Underneath, there are 4 GB of RAM soldered on the motherboard, plus a free memory slot that can take an up to 8 GB module, for a total of 12 (like we have on this unit). 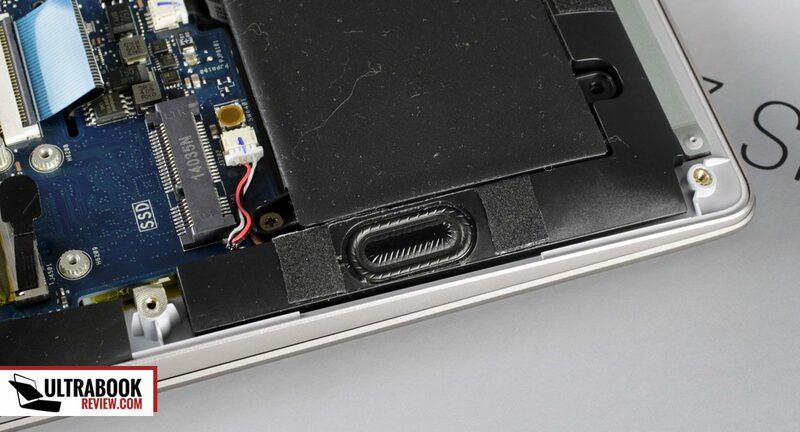 There’s also a 2.5 inch 7 mm storage drive, but in this case, it is occupied by a SanDisk SD6SP1M-256G-1102 SSD in a special adapter, which is actually an NGFF M.2 pen-drive, identical to those used on the Zenbook UX301LA. Asus probably went with this approach to save costs, but I believe the UX303LN will also be available with HDD’s that you could then replace with your own 2.5″ 7mm SSDs. 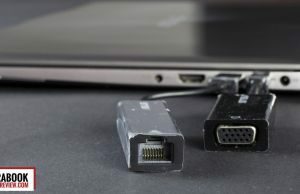 To back up this theory, we have an mSATA connector in the right side of the laptop (not an M.2 connector, an mSATA one, from the looks of the pins – Thanks Yep for pointing this out in the comments), which is unoccupied on this particular unit and should take the caching SSD for HDD equipped versions. 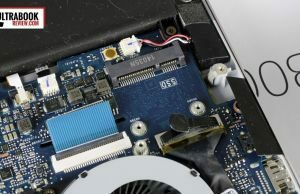 You should also be able to connect a half-size mSATA SSD on this free slot and use it as a boot drive, if you want to. Update: Be advised, if you’re buying this in the US and Canada, replacing the main storage solution yourself will void warranty, according to this tweet from Asus North America. That’s…. unfortunate, to put it mildly. 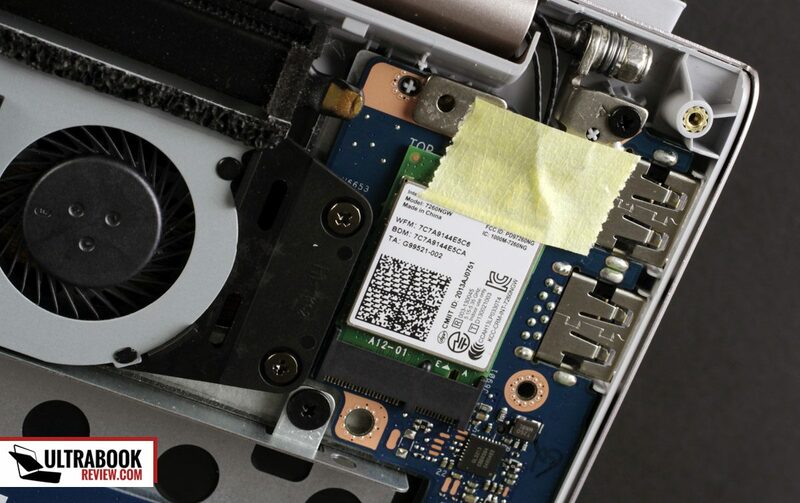 They probably put a sticker on one of the screws to prevent you from accessing the drive, which shouldn’t be that easy to peel of careful and then reapply, but DO IT ON YOUR OWN RISK! The rest of the pics show you the internals in all their glory, with the heat-pipes, the cooling fans, the speakers, the Wi-Fi Module and the battery, which is hold in place by a couple of screws and should be fairly easily serviced, if needed. Anyway, I ran a couple of games on this laptop and you can find the results below. As a side note, all those numbers are recorded with FRAPS, so without running this piece of software, you should expect 1-3 fps extra in each case. Judge the results by yourself and let me know what you think in the comments section at the end of the post. I also ran a couple of synthetic benchmarks, and you can find the numbers below. If you want to see how these stack against last year’s Zenbook UX302LG, compare them to the numbers in here. CineBench R15: OpenGL 56.58 fps, CPU 256 cb. Keep in mind that all these numbers were recorded with the Nvidia 332.50 drivers, as these were the only one I was able to install on the tested unit. More recent drivers that should, in theory, support the Nvidia 840M chip, failed to install on this Zenbook. So in time, with better performing drivers, those numbers should actually get better. All in all, the UX303LN is fast. The Core i7-4510U is just a higher clocked version of the Core i7-4500U, so you’ll hardly feel the bump in everyday use or in benchmarks. But the Nvidia 840M graphics chip is clearly faster than the Nvidia 730M found on last year’s UX302, while it requires pretty much the same amount of power. The entire laptop does seem to run somewhat hotter under load though. In fact, when running games, the CPU gets close and even passes past 90 Centigrades, which is quite high. There’s no throttling, and that’s the good news, but the high temperatures might have unpleasant long-term effects on the silicone. So if you do decide to buy this laptop, make sure you get extended warranty for it. Better safe than sorry. 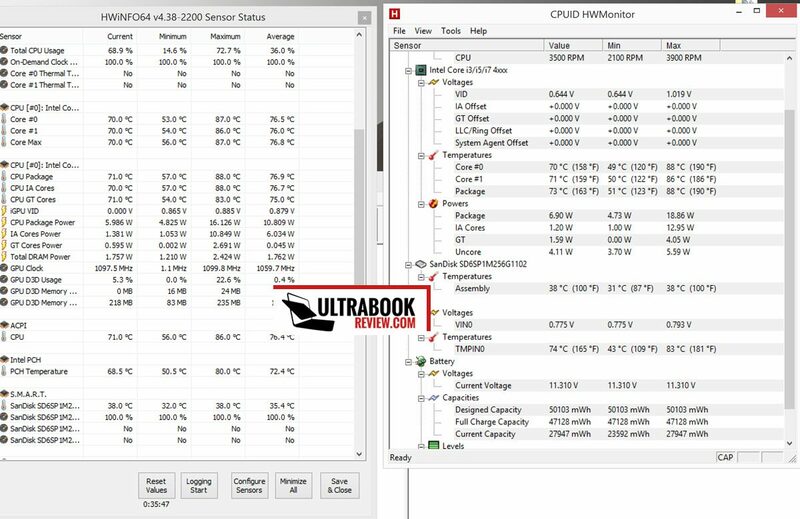 Some of you suggested trying to overclock the 840M chip, but given how this laptop already runs very hot under load, I’m not going to do it on a pre-release unit. 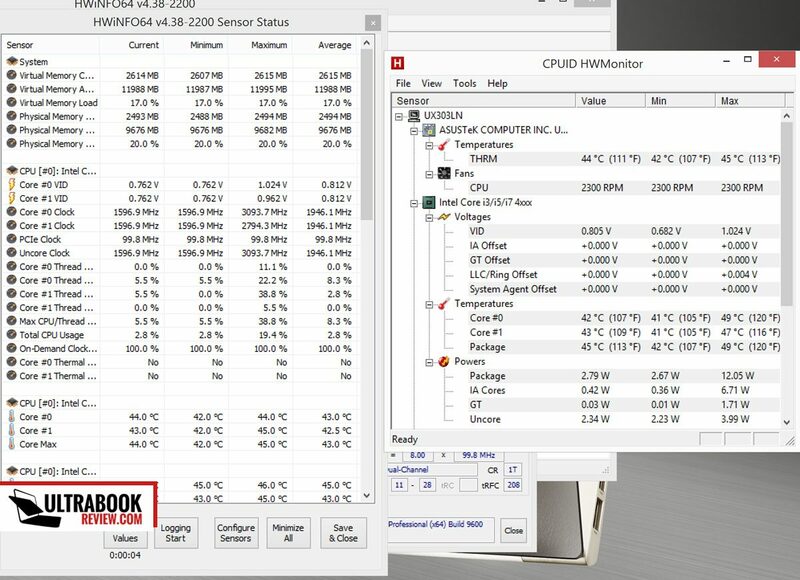 And if you do overclock your unit, make sure you know what you’re doing and keep a close eye on those temperatures. The UX303LN runs cool and quiet in daily use. In fact, you’ll hardly hear the fans in this case, although there is an annoying high-pitch metallic buzz coming from one of the fans that I found distracting. Hopefully final retail units won’t have this issue. Under load, the fans are still fairly quiet. I’ve measured a 40 db noise level at 50 cm in front of the laptop (where a user would normally seat) while running games, which is quite low. 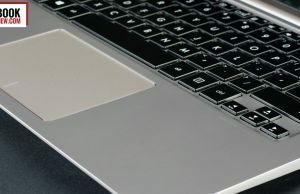 The laptop’s body tends to get warm overall, as heat easily dissipates through aluminum, but the palm rest or the keyboard never get more then merely warm. The area on top of the keyboard, around the cooling grill, and of course the rear part of the underbelly, do get hot however. Speaking of the cooling solution, this laptop blows hot air from behind the screen’s hinge, towards the screen and indirectly towards the user. That can be unpleasant and also causes the screen to heat up, which might have a negative impact on the panel. However, on this implementation, the hinge actually sits between the cooling grills and the display, so the panel doesn’t get that hot and shouldn’t suffer any long-term side effects. The implementation Asus used for the UX302 was actually more problematic, as the cooling mesh and the screen where a lot closer. So while this approach is still not perfect, it’s better than last year’s. That aside, this Zenbook houses some powerful speakers, mounted on the sides, facing down, like on all the other Zenbooks before. They are loud. In fact, and this might sound weird, they are too loud. Not on high volume, but actually at the lowest volume. I’ve found myself having to adjust in-game sound in some situations or the sound in the Youtube player, as actually tuning down the volume in Windows to only 2% was still too loud. On top of this, the audio quality is not impressive (although definitely not bad either, for an ultrabook), despite that Bang&Olufsen Technology logo on the case. The sound coming out of these speakers is rather metallic and tiny and if you’ll pump up the volume, you’ll hear the distortions and feel the vibrations ramping through the laptop’s body. There’s not a lot to say about the webcam at the top of the screen, other that it does its job. However, Asus moved the microphones. They are no longer on the bezel, flanking the camera, but beneath the laptop, towards the front, which is a bit of an odd placement, if you ask me. 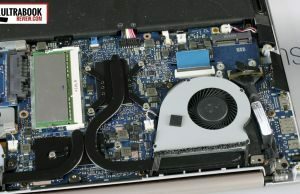 Connectivity wise, this unit comes with Wi-Fi AC, Bluetooth and Gigabit Ethernet via the included adapter, and the Intel Wi-Fi module (Intel Dual Band AC 7260) proved to be reliable and consistent. Getting a bit further away from the router will lead to poorer signal strength then on my ThinkPad X220, but that’s a given with metal laptops and it’s not something you should be greatly concerned about. Besides that, I have nothing to complain here. The Zenbook UX303LN packs a 50 Wh battery and for me, that translates in roughly about 5 hours of daily use. However, this is highly subjective and will greatly vary from user to user, based on how and what you’ll do on your machine. My usage scenario keeps the laptop on Balanced mode, with Wi-Fi ON, screen at 50% (I turn OFF the auto-brightness adjustment in Windows 8.1) and the keyboard’s brightness at level 1, while performing various daily tasks: browsing, chatting, watching movies on Youtube, some light photo editing in Photoshop, listening to some music. You can squeeze more than 6 hours if you’ll use the laptop lightly and dim the screen more, and at the same time, you’ll get under 2 hours when running games or other heavy tasks. If we’re to look at Battery Bar readings, the laptop discharges with about 6 mW per hour when idle (with the above mentioned settings) and about 10-11 while running a Full HD video on Youtube. That translates to up to 8 hours of idle runtime and under 5 for watching Youtube clips. I also ran the PC Mark 08 Home Conventional Battery Test, which resulted in a score of 1942 points and the battery depleting from 100% to 20% in a little under 2 hours and 30 minutes. The test simulates “common home computing tests”, but in my real-life scenario, this Zenbook actually lasted a lot more. Long story short, the tested Zenbook UX303LN does not offer impressive runtimes. But given the specs, I’d say it’s not that bad either. And the immature drivers might actually have a negative effect as well, which means that final retail units could last longer. But I wouldn’t hold my breath for it. The UX303LN does come with a Macbook-like charger, with the power plug integrated withing the brick and a long cable. 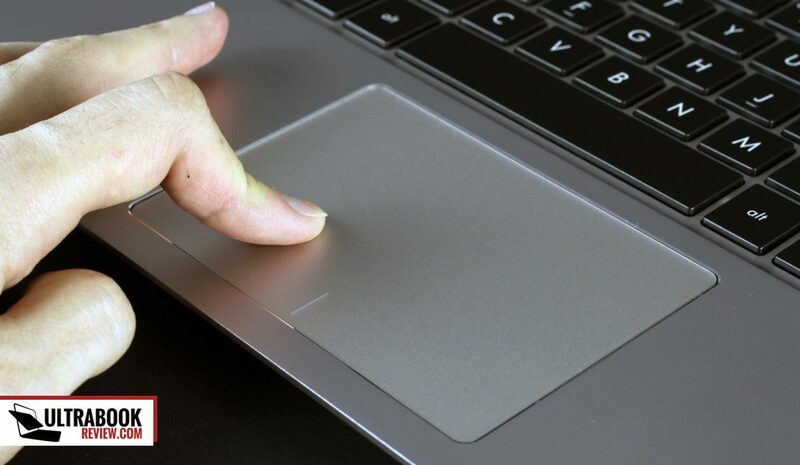 The charging tip is a bit loose though and there’s a light charging buzz that you will feel when keeping your hands on the palm-rest while the laptop charges. It’s a bit annoying at start, but I got used to it in the end. 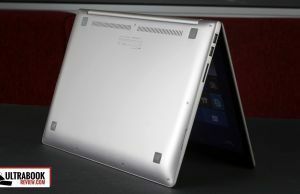 I do know that this laptop should be available in stores here in Europe at the beginning of July, hopefully sooner. The initial dates I was given proved wrong and this laptop has been delayed. As of Mid-August, a few configurations are available for pre-order in some countries, scheduled to ship at the beginning of September. Update: You can check out the latest prices and potential discounts via this link. There are a couple of different configurations available for this unit. Below you’ll find the ones available in Europe, they might somewhat differ in the US and other regions. Intel Core i7-4510U, Nvidia 840M, 256 GB SSD, 12 GB RAM, 3200 x 1800 px IPS glare touchscreen, Windows 8.1 Pro – roughly 1250 euros (should translate in $1300-$1400 in the US). Too bad there’s no i7 + HDD + FHD IPS panel combo, that would have been a great buy with room for potential upgrades. Even so, these prices are really solid. That mid configuration certainly offers a lot for the money and packs a non-glare non-touch screen, which I find well suited for a potential gaming laptop like this one. The top configuration does not sound that appealing to me, but if you do want a touchscreen, more RAM out of the box and a high-resolution panel, it might be worth those extra 150 euros for some of you. UX303LA-DB71T – starts at $899 (shipping) – FHD touchscreen, Intel Core i5-4210U CPU, 8 GB of RAM, 128 GB SSD, NO dedicated graphics, Wi-Fi AC, Windows 8.1. If you’re in the market for a 13 inch ultrabook that weighs around 3 pounds and can actually cope well with most modern games, you won’t find anything better than this Asus Zenbook UX303LN right now. 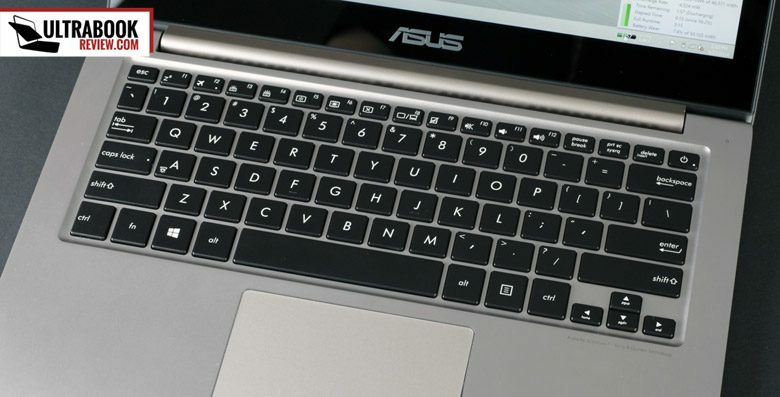 Asus squeezed powerful hardware in its sleek aluminum body, and that allows it to fly in most activities. 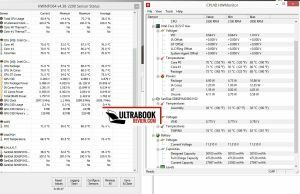 But at the same time, the laptop tends to get hot under load and pales in comparison to other Haswell ultrabooks when it comes to battery life. So you loose some on these fronts, in order to get the graphics performance. If you don’t need those though, you can check out the Zenbook UX303LA, mostly identical to the LN version, but without the dedicated graphics chip. However, if you want a truly powerful gaming ultraportable, this Zenbook UX303LN might not suffice, as there are still plenty of titles that can put it to its knees on 19 x 10 resolutions with High+ details. 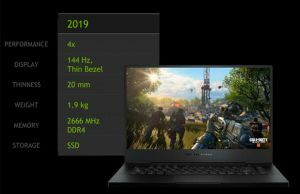 In this case, you might want to look at some of the beefier gaming ultrabooks listed in this article, which are somewhat larger and heavier, but also faster. At the end of the day, the Asus Zenbook UX303LN is not for everyone. But if you want a light and compact ultrabook that can handle more than occasional gaming, this should definitely be on your list. The price and the availability will however make it or break it. Hopefully Asus will manage to have it shipped worldwide, unlike what happened with their previous Zenbook UX302LG, and for a correct price. If this happens, I’m confident the UX303LN will become more popular than its grandfather was, the Zenbook UX32VD, back in 2012. We’ll see. With prices ranging between roughly $800 and $1300 , the UX303LN sure offers a lot for the money. Hopefully Asus will have it available worldwide and in great numbers, as I’m pretty sure quite a lot of you will want to grab their hands on one of these. That pretty much wraps up this review. Thanks for sticking by and if you have any questions or things do add about the Asus Zenbook UX303 LN, leave them below in the comments sections, I’ll be around to reply. 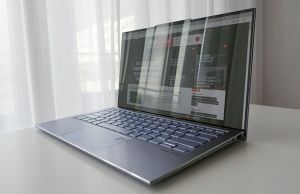 is this ultrabook still the best option if i’m looking for a full metal case (like the macbook-air), a good trackpad (like the macbook-air) and looks very tiny (like the macbook-air) ?! Well. not necessarily. It’s the best 13 incher with dedicated graphics, but it’s not the best ultraportable out there. For what you need BTW you should check out the Dell XPS 13 2015. I’ve just bought one myself and I’m digging it. Has the color issue been resolved i want to use it for editing gopro footage so i suppose color will play a big role what do you suggest. What would you suggest the Yoga 3 or this as this is my two choices and i do not want to replace it in year or two i want to get a few years out of the ultrabook. How bad is the color issue is it a deal breaker or not really. Are you going to play games? If yes, then go for this Asus. If not, the form factor of the Yoga 3 is going to give you a more versatile device. Also i looked at the dell but its only a 2k ultrabook. Many folks are complaining about the customer services at ASUS and the laptop falling apart after a month or two of use. Do you have any insight into that? As dori daca se poate o adresa de email si un numar de telefon pentru a discuta o posibila colaborare. Doresc sa imi iau un ultrabook si sunt extrem de nehotarat si ar fi mai simplu daca am putea discuta direct. Va multumesc anticipat. I’ve used the laptop for around 6 months only and the hard disk has completely crashed . The customer service is also really bad as they did not get back to me regarding the arrangement of an appointment to fix my laptop. Final decision I made was ASUS with i7, 8GB RAM, touch screen, 128GB SSD. Screen resolution is 1920×1080. 1. Body-material – very good aluminium material, very stable…. 2. Keyboard – very good feeling, very good layout, missing PgDn, PgUp, INS (you need to press Fn key to use). No problems. 6. Display – very bright, smart colors. Good resolution. I can’t imagine larger resolution on 13 inch display (too small for normal work). 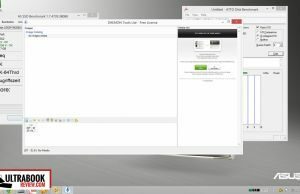 USB problems – Notebook was delivered with USB failure. One of three USB ports was not working. 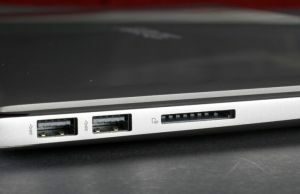 Usage of the rest USB ports was not possible, ports were always after few minutes disconnected. Finally a had to send notebook to service. The problem was fixed by motherboard exchange:-( Now everyting works fine. I hope it was the last problem. This is exactly what I’m looking for but I live in Portugal. Can you please tell me where did you bought yours? Thank you. I’m looking forward to upgrade my system. I’m also using notebook and external monitor. 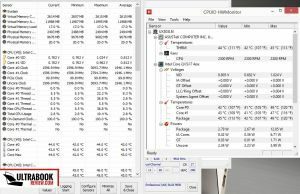 Does your ASUS UX303 get hot when lid is closed? 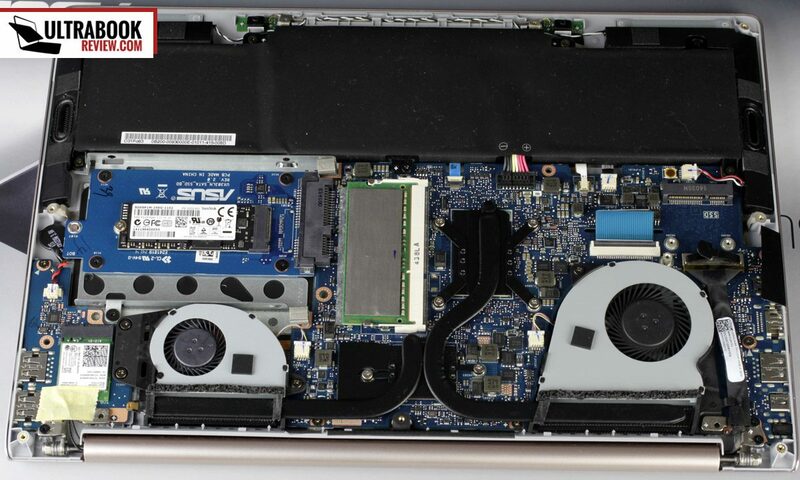 If I am not mistaken vent holes are located that way that they are blocked when the lid is closed..
And secodn question – is this ultrabook quiet or get noisy when warm? What’s the best ram to use to upgrade the UX303LN C4147H 12GB? Also, has anyone tried using the spare mini msata SSD slot yet? If so, any recommendations? First off, thanks for a great site with great reviews! Would you say the new UX303LN-R4290H with 5500U processor is worth it’s money in this day? Is the GT 840M graphic card still doing good? And about the screen, have you heard or read anything about the colors? I’m photographing as a hobby and would need a calibrated screen. How would this screen do in photo-editing? Thanks in beforehand for answer! 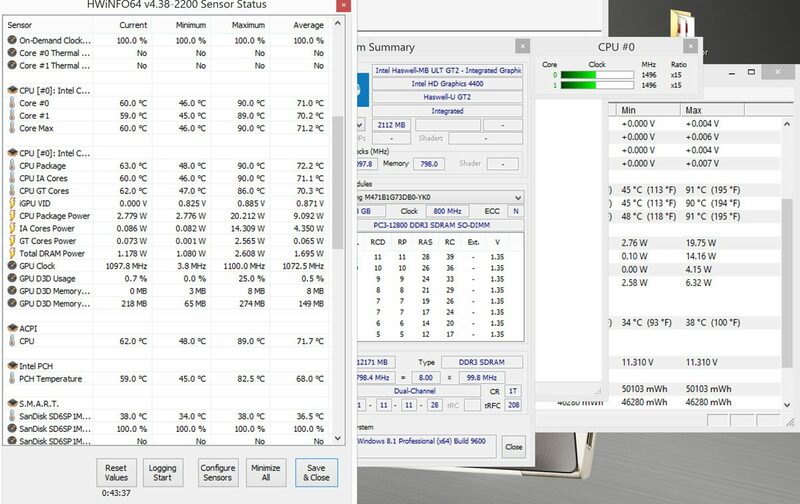 The i7-5500 is about 10% faster than the i7-4500u in benchmarks and you probably won’t see the difference in practice. it is however more efficient. However, i’m not aware of any working fix for the screen. You should look into it, otherwise stay away, you won’t be able to do proper image work on it, unless you use an external monitor. 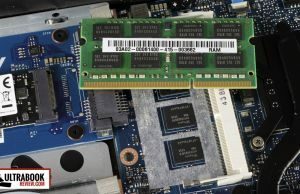 Do you happen to know what the latency of the on board ram is for the UX303LN? Asus technical support won’t advise, as they say it will void the warranty if you upgrade it. As I have understood the coloring problem only applies to the 3200*1800 screen? Not the 1920*1080 screen? 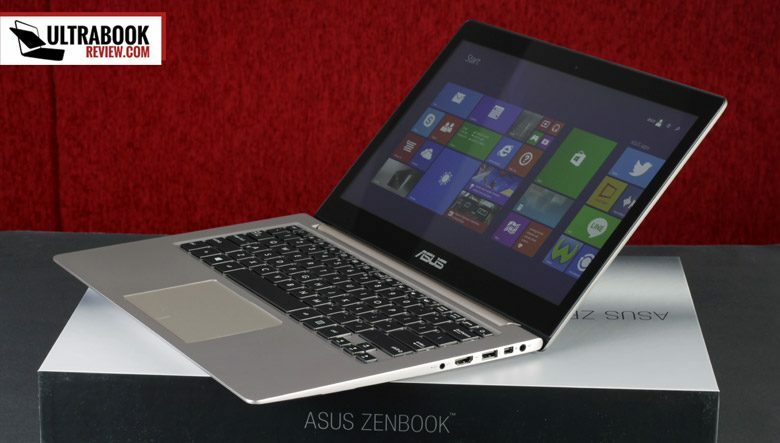 Ok, so the ASUS Zenbook UX303LN-DB71T is almost exactly what I’m looking for. The only problem is the QHD screen, which I wouldn’t mind if it wasn’t for the colour calibrating issues that comes with it. I’m looking for a model with basically the exact some specs of UX303LN-DB71T, with the exception of the QHD screen. Is there a model where it comes with the same specs but FHD instead? If not, anything as closely similar as possible but with FHD? Also I live in the US, thought it’s also worth mentioning that. A link if at all possible please, thank you for your time. THere’s no similar 13 inchers, but the Lenovo ThinkPad Yoga 14 offers a very similar configuration and the screen you want, but it slightly larger and heavier. No problem, found a solution to this colour problem. 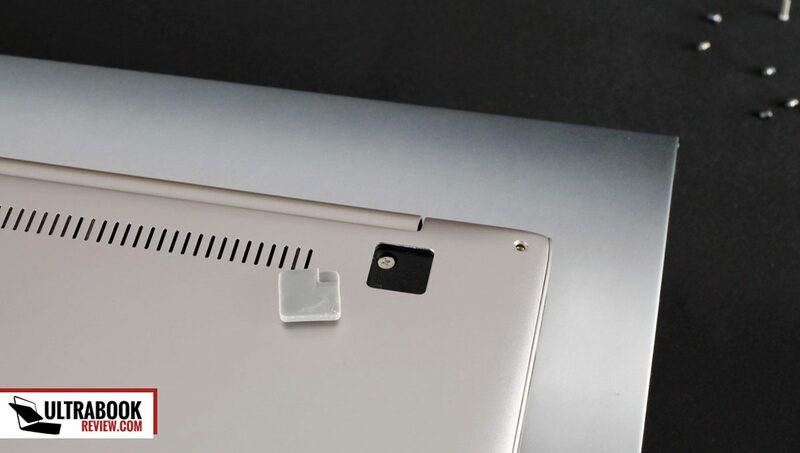 Now however, I’m still hesitating to buy it, because just as I was about to order it through amazon, I decided to look through all the reviews again, and I noticed a trend; it seems that there is a problem with the hinges of the laptop and how it would break after only 3 months. All these reviewers said it broke within 3-5 months, and there was a worrying amount of them claiming this. Asus replied to these reviews and claimed the following: “All ASUS products undergo intensive quality control testing and inspections, this is an isolated case.” Now I really am unsure the legitimacy of this claim, seeing as they won’t even acknowledge the yellow colour issue…So I find myself at a predicament, after overcoming the colour issue, there is now this faulty hinge issue, which, may I add, is actually an issue that I have with my current laptop. It’s a lenovo G570, and a very known and common issue is the design flaw where the left hinge will break apart after a few months. I’ve had this laptop for about 3 years, and for the most part manage to stick with it despite the damage. So I definitely do not want another experience like this…Basically I’m asking whether the hinge issue that the ux303 model have applies for all or only as they claimed “an isolated case”? I’ve heard some complains about that myself. One or two readers even contacted me about that and from what I know, Asus repaired their products under warranty. Still, it’s highly annoying. I haven’t used one of these for a long time and can’t say what it would take for the hinges to come apart, but all those who had the problem said they were treating them very nicely. I have had this issue and ASUS is refusing to fix the issue. There are several other people online I've talked to who have complained about similar issues with ASUS support. Considering this has been a reported issue since 2008 models, I wouldn't be too hopeful that they're actually enacting a real fix in the design. It's just frustrating that my efforts to get the hinge fix were dismissed. They say that the warranty – I bought a 2 year warranty, btw – doesn't cover "physical damage". Apparently ASUS charges almost $700 to fix this issue if it's not under their warranty, so given how easily the hinges break, I would steer clear unless you want to pay half the cost of your laptop (or more) on repairs. I have had my Asus UX 303L for about two years and the hinge just broke so I I have my doubts that it is an isolated case. I am wondering if it is worth fixing…. Replied to this before but apparently it didn’t go through, so I’m assuming it got taken down for some reason, so this time I’ll make it very short and straight forward. Reviews from amazon suggests that the ux303 model has a design flaw that will cause the hinges to break apart in a matter of 3-5 months. Note that there were a worrying amount of reviewers who mentioned this, and they all claimed to have taken care of it. So my question is, is this really a design flaw or was it just a defect for those few customers? Already got a solution for the colour issue but this hinge problem is the only thing holding me back at the moment. I bought an Asus UX303LA in September of 2014. The hinge broke on me after about 9 months of use. Asus covered the repair under the warranty but it broke AGAIN after another 4 months, just after the warranty expired. Highly, highly disappointing. I loved everything else about the computer, but I cannot recommend it because of this issue. Hey Andrei, I know you mentioned one of the major cons was the issue with the colors at the QHD resolution. Would it make sense then to change the default resolution to 1920 x 1080? Would this fix the color issues? Sorry if this is a dumb question, I’m not great with computers. Hi Jason, the resolution has nothing to do with it, there’s a problem with the screen’s panel, which is unable to display colors accurately. There’s nothing we as end users can do, only Asus can release a software fix through a BIOS update. Enjoy very much with your great review! And I just purchased the UX303LN. However, i am having some problems about touchpad gestures. Hope you may kindly help me. First, is there any gestures available for next/previous page in browser? 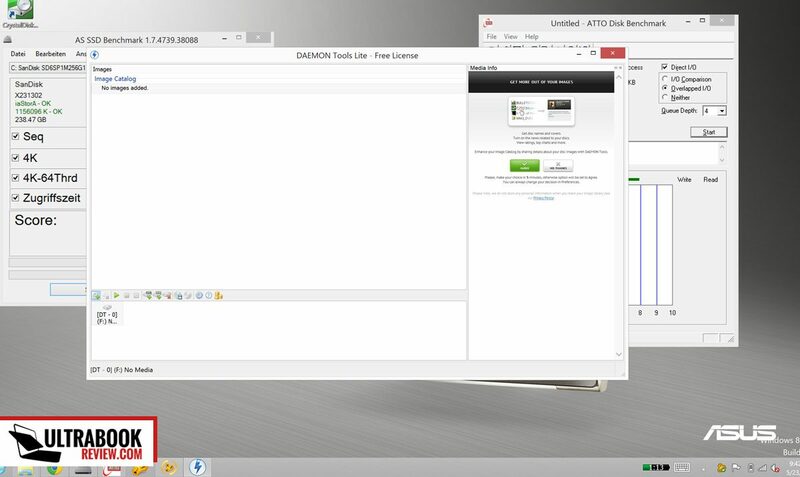 i am currently using google chrome. The built in ASUS smart gestures offers the 3 fingers gestures, but it only works in file explorer but not browser. Second, is there a scroll bar option in the touchpad just like those old school laptop back to win 7 or win xp? instead of using the two fingers scroll, i prefer the old style. sorry for your time and looking forward for your reply! HI, I no longer have this around and can’t offer proper answers for your questions. Hopefully some of the other readers will pitch in though. which is will be great to solve yellow color issue. I am not sure with this graphic it will be same as NIVIDIA G-Force or this is only by mistake mentioned at the web site. That looks more like an UX303LA to me, which lacks the Nvidia 840M graphics, although the titles says otherwise. And yes, the FHD panel doesn’t suffer from the skewed yellows. You should contact Asus and ask for clarifications, if it’s an LN it packs the Nvidia graphics, if not it’s an LA. You should contact the service. And does the laptop boot with the power plug connected? Hi,nope.Its completely bricked.Battery is still fully charged.Only the power button light switches on.I have already arranged the service pickup.Actually i remember i have installed the latest windows updates just a day before,but that should not affect the whole device this way. My unit was received by the repair service 10 days ago,and so far i did not hear from them.I have contacted the Asus customer service and they have confirmed, that my item was received and is being fixed and no parts was ordered yet. Asus guarantee that from the day of the pickup,you should receive your unit back within 7 working days. That’s gone now,and i still don’t have any information whats going on.It looks like they are taking their time. I assume it’s the motherboard that is going to be replaced. They have also advised me to contact them if I don’t receive my device within a week time from today. Hi,yesterday I have received my unit back from the repair service.The problem was the main board.That was replaced.Its back to normal now,hopefully i will be able to turn it back on again after next charge.Fingers crossed.Total duration of the repair was 25 days. I set the firewall config so demanding that it would not let Windows start up (it did but i could only see a black screen). I managed to start in safe mode and change the firewall settings. It is very weird that you cannot start windows in safe mode or at least access the bios. I would try restarting the laptop with windows setup in a usb (press escape while turning on to select the usb). If install runs try a windows repair and / or clean install. Just ran into.this thread.During my present vacation my newly bought UX303L just quit working. I have a UX31 Since long and its running like Usain Bolt, just small ssd so I decided to get this new machine. And boom dead! Any idea of what the problem might be. Its still on warranty but its annoying when on vacation away from home for quite sometime. Suggestions of how to fix the machine? How is the volume controlled? through button pushing or is there an external manual control? And you call yourself an expert reviewer for real? the reasons colours are off is that by default there is an Asus Program istalled called Asus Splendid which boosts the colours level. Once you set it to normal or unistall it all together colours go back to being absolutely fine. It took me 5 minutes to figure out by cheching the asus programs installed and i am pretty much your average joe pcwise. Just to be sure, we’re talking about the UX303LN here with the 3200 x 1800 px display. If you’re saying the colors are alright now in your case, put an iPhone/iPad or anything with a good screen next to your laptop and Google for RGB CMYK :) I’m not aware of any BIOS fix that addressed the colors, but I might be wrong, haven’t looked up closely on this matter lately. I wanted to know if you can tell us what the fix should be for the UX303LN screen for the yellow problem. I am overseas now and will be returning to the USA in two months and i wanted to buy this ultrabook when I get back. Do we need to update the BIOS, firmware or something else. I just wanted to be ready before buying the computer. 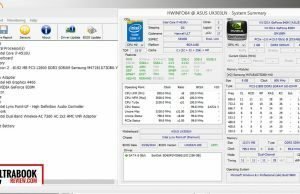 Asus needs to release a BIOS update in order to address this issue, but they have not, at least from what I know. There’s no way us, as buyers/users/ can fix it. question about the msata port does it support 3Gbps or 6Gbps devices? I was looking at the Emperor Disk 128GB mSATA Mini (Half Size) SATAIII SSD. You can add the above msata mini for extra storage space, But also could it be used as a caching drive? would this help with performance? I would like to be able to use it in a Raid 0 setup. 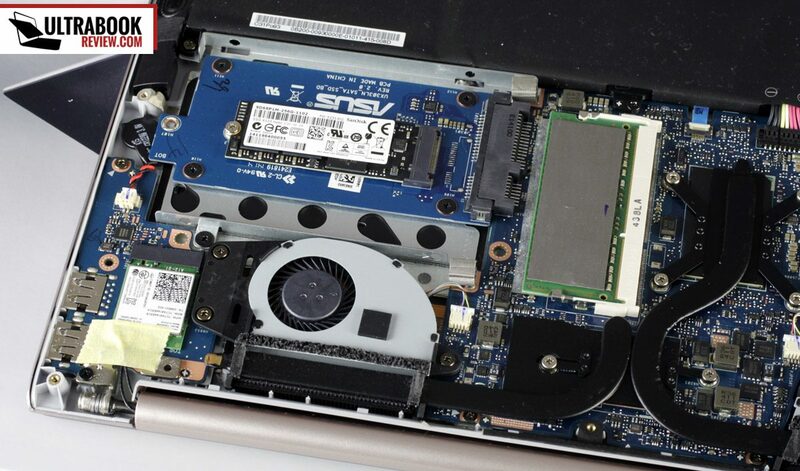 It would be nice if the 850 evo m.2 and 850 evo msata 256gb would be supported on this ultrabook. Wish they put in on sale in Spain someday. Hello! I want to know if this laptop is suitable for students? Also, I might also do some gaming. Will this be suitable for me? I love this laptop. Light and powerful, but I was looking up solutions or complaints because my monitor is really wobbly. I bought it in Sept of 2014 and after looking up Amazon reviews I’m pretty sure I’m not too far away from cracking hinges. Upon close inspection I see a little separation where the back of the monitor attaches to the hinge. Really bummed about this because I realize this means I’m going to be without a laptop while they fix the problem. I’m wondering if I should send in now or wait till it inevitably starts cracking. Really disappointed. I’d also like to point out I’ve never had any issues with laptops in the past, including my previous Asus which is 5 years old. Maybe the new 2015 version of UX303LN has improved hinges? Maybe is possible to calibrate the display with a specific software/hardware for professional use? Or maybe not… anyways it’s not for sale in Spain nor with Spanish keyboard, i’ll squeeze my ux31a until the 303ln is available in my country. Would you recommend the asus UX303LN for a graduate engineering student? I will be using the laptop for daily use (internet, word, emails etc) and from time to time running engineering software (CAD, simulations etc). If so would you recommend the intel core i7 4510U or core i7 5500U? 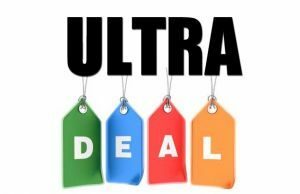 If not what other ultra portable would you recommend (upto a value of $1500 US) for the uses that I sepcified. It can be either Asus or other brands. Great review. I wanted a good laptop to backup my PC (travelling etc.) To cut the story short I bought a UX303L (Intel I7 – 4510 U, GeForce GT 840M, 256GB SSD, SDHC card reader, Win 8.1), a few hours ago ($1299CAD). When I got home the marriage became a little rocky: there was no Ethernet/USB dongle; I have about 85 GB of free disk space; and the card reader doesn’t do SDXC (I think SDHC is limited to 32 GB). Basically I want more storage and I will be happy. I saw your review before I bought the unit, and I noticed that small SSD (2.5 inch?) port in the top right hand corner. Can I just buy a 2.5″ SSD and bung it in there? I have noticed a 500GB Crucial drive for $250, a Samsung 1.0 TB for $700, and some Intel units that are a little pricey, but I have a 440 GB and 220 GB Intel drives on my PC and I like them (dimensions 2.5″ x 3.73″ x 7 mm + 2mm plastic frame). 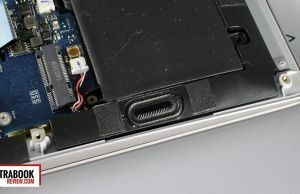 Sorry for waffling – my question is can I install a second SSD in my Zen Book? 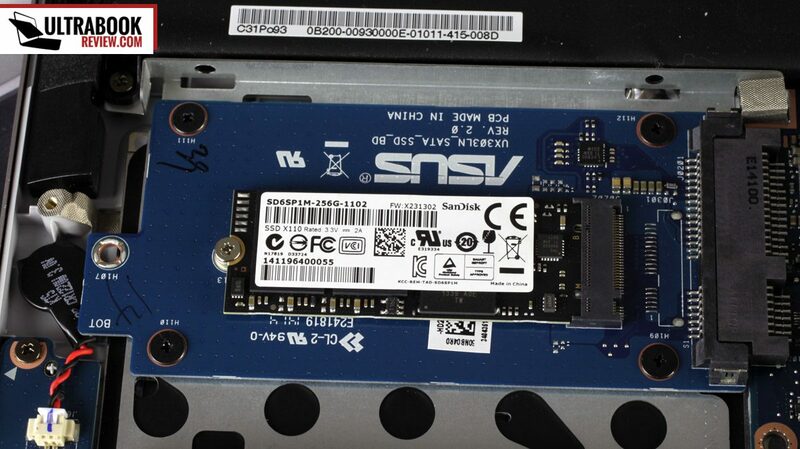 I’d replace the existing SSD with a bigger one. You can install a second SSD on the spare mSATA mini port from what I remember, but I don’t think it will be worth the fuss. Those are slow and expensive. 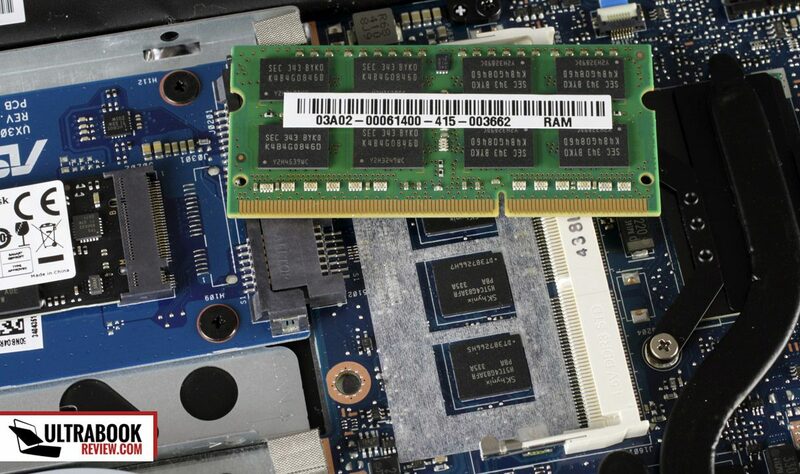 Just replace the 256 GB 7mm 2.5″ bay with a bigger one, clone it on the new SSD and you’re good to go. However, replacing the SSD might void warranty in some regions, you might want to check for any warranty stickers on the screws that hold the SSD cage in place or ask the local Asus representatives about that. I’ve been considering buying a new laptop for a while and now that I found this one, which seems great, I find out its been out for like 9 months already. Do you know when ASUS intends to do their refresh for the laptop? I might just wait if its before the new school year in September. They recently refreshed this model with Broadwell hardware so I don’t think a new version will be launched till the end of this year. Maybe Q4 might bring a Skylake update. The laptop with run Atilla nicely in HD or FHD resolutions, just not on max details. I’be been looking into the asus E451LD-XB51 and the asus UX303LN for school and work. Battery life is important. Does anyone know how the battery life compare to each other? I have a HDD drive in Zenbook UX303. 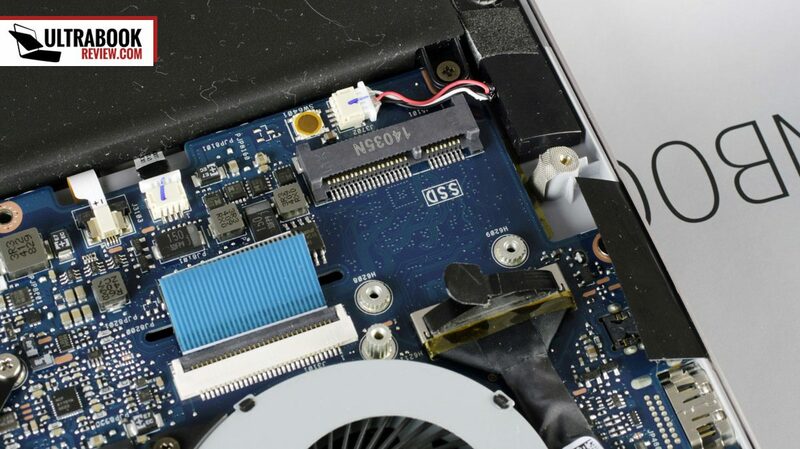 Can I use mSata connector to put ssd as second hard drive with standard HDD drive? 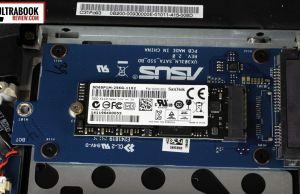 (120/128 GB SSD drive on mSata)? or it will any problems? I was just wondering if anyone has experienced USB power issues with the UX series two left USB ports? I have the previous generation UX302 LG and it seems that I can only use the one USB port on the right side with reliable results e.g. 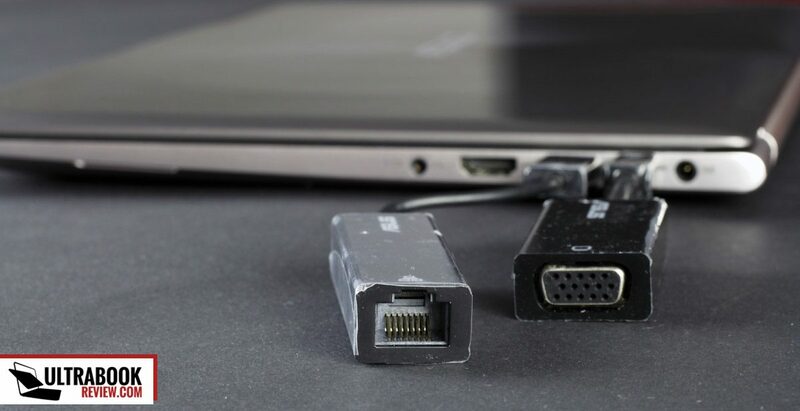 if I use the Ethernet adapter or any other USB adapter/ USB flash drive, etc. in either of the two left USB ports, the adapter constantly blinks on and then off, and Windows makes the connect disconnect chime. When I was in Taiwan last fall, I decided to go to the source and bring it to an ASUS tech center and the technician told me that due to the ultra thin design of the unit, they had to make some compromises with the power and the USB ports to the left are further away from the power source and therefore cannot maintain consistent power. He recommended that I use the one USB port on the right of the machine for anything that requires consistent power. This seems a bit odd and a bit of a letdown considering how expensive this unit was. I was wondering if anyone else had the same problem? I think it’s OK. but if it bothers you in everyday use or when watching movies, return it. It’s important to be satisfied with your laptop. I returned mine because de left hinge broken in 2 weeks. For nothing. It was ok in the morning then I went to work and when I was arrived I’ve tried to open the lid and it just didn’t open. Too bad… Plastic painted hinge with bad quality. You will have problems here! Andrei: will you write a review? Hi Pedro. I’d love to but the X360 is not yet available over here. 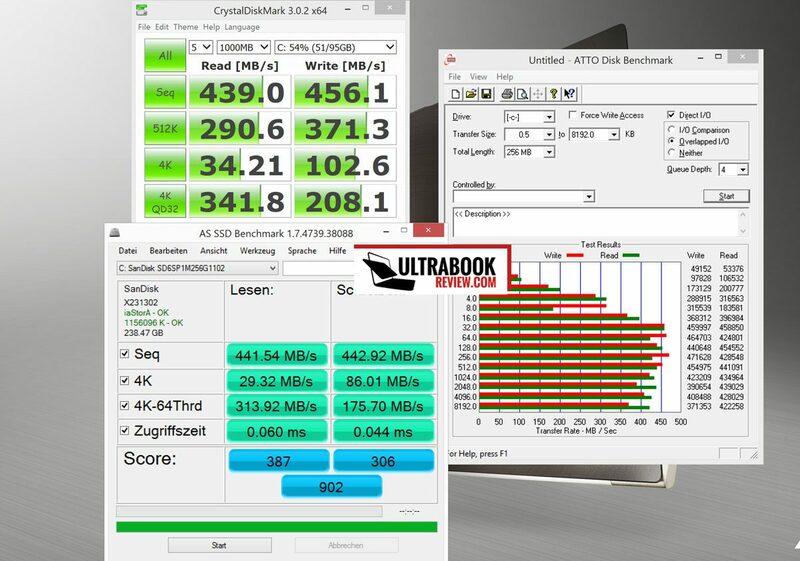 The spec of Zenbook XPS 303LN that’s here in SE Asia: i7 5500U, DDR3 8 GB, HDD 1 TB Sata + SSD 24 GB, Nvidia GT840M 2 GB. It’s selling for ~US$1100. From the two choices above, which one do you think presents the better value for its spec? Thank you for doing these reviews! I forgot to mention the XPS 303LN I mentioned is also not touchscreen. Well, those are completely different machines and both are OK for what they are. 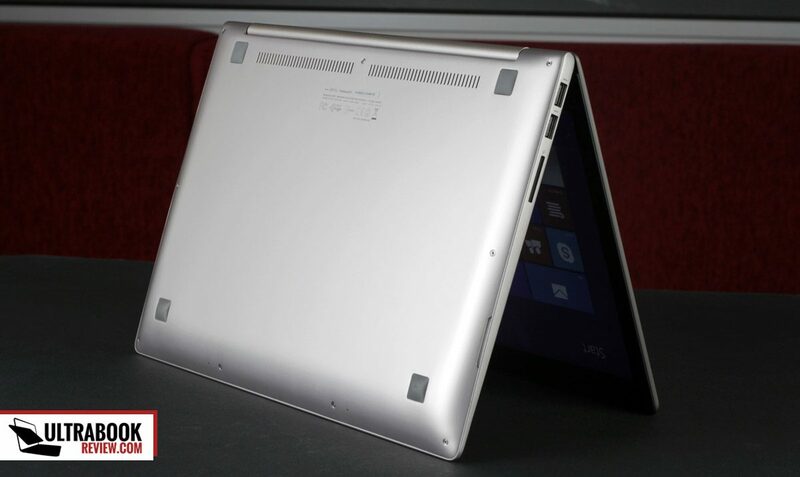 The UX305 is a thin and light laptop made for casual use. It’s also fanless. the UX303LN is something to consider for performance and especially for gaming, due to the dedicated graphics it offers. Pick based on what you need. 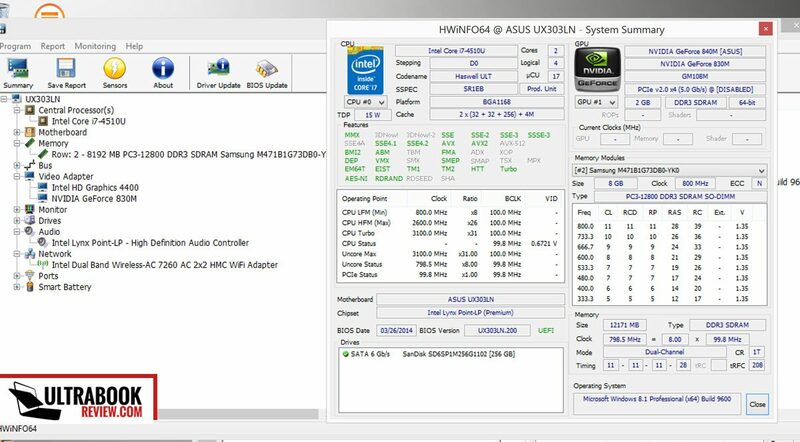 my notebook Asus ux 303-L came with 8 GB RAM , can i increase ram to be 16 GB ,if possible ,is it useful with performance or not ? > running a Full HD video on Youtube. The W/h unit in the above statement makes no sense. Perhaps you meant energy consumption (Wh), or power of the load (W or Wh/h), or maybe you meant a battery voltage drop (V/h). I have purchased this model but i hear a light squeaked sound like a whir when i power the laptop on. i had this problem from the beginning. the support technicians told that this is usual in this model because of its compact design. but this is really annoying. anyone had this problem? what can i do? is that a normal sound? Hi, I just bought this laptop and I LOVE it, but there is just one issue I could find. The keyboard is supposed to be backlit, there are literally two buttons that are clearly the backlit on/off toggles, yet I cannot for the life of me figure out how to turn on the keyboard! Could someone please tell me how? I feel so stupid as it seems very obvious. Thanks! press FN (lower left side of the keyboard) + the according F key that turns keyboard brightness up at the same time. I can’t recall exactly which F key is that, but there’s a pictogram on it. Yes, I have tried that. Fn + f4 should turn it on, but nothing happens. When I first turn on the laptop the backlight comes on for a few seconds but then it just turns off as soon as t goes to the lock screen. I don’t know what the problem is! It’s really annoying as I do like having the backlight even when using the laptop in high light areas. I own this laptop for a while now. A month after I bought it I started having problems charging it- the charging indicator would just go on and off constantly, as the laptop was connecting and disconnecting continuously. Anyone else had a similar problem? Does anyone know what can be the cause of the breaks? Bad charging port/ bad charger/ bad battery? Any way to fix it permanently and so I won’t have to pay every few months to get it soldered back together? I’m going to be using this laptop for school and personal use. Can anyone tell me how the laptop holds up after several months of everyday use? As well as if they experienced any other structural and otherwise problems after owning the laptop after a while? my display broke off after 1 year. because i opened it from one side only, not the middle.. falls not under warranty..
i live in asia, in my country, i have UX303 i5, 8gb ram, ssd 256, gtx 840m. I work with photoshop, illustrator, proshow gold every day in my office. Should i buy this UX303 ? What’s the screen resolution of that unit? if it’s 3200 x 1800 px, stay away, that panel is not able to reproduce colors accurately. If it’s 1920 x 1080 px then it’s going to be OK.
It’s 1920×1080, so it will be ok with my job, right ? Just graphic design. Thanks Andrei ! Salutare ! Ai putea te rog sa partajezi wallpaper-urile stock sau un link catre ele ? Multumesc frumos ! >>> but I was more wondering if anyone here knows about a fix/solution for the color problem ? Did asus released anything ? The hinges on my Asus ux303ln broke completely off after just 3 months of careful use. I sent it back to Asus and they did the repair which included replaced hinges and screen. My question is when Asus makes this repair do they use a different design or better hing to screen assembly or do they replace with the original cheapo plastic design? I cannot tell by looking at it as the vent shield hides the hinge assembly and I don’t want to try taking it apart. I currently have the i7 4510U+QHD Touch+256 SSD+8gb ram+840M variant of the UX303LN. It is a great ultrabook at this price point pack with all these specs, but one problem I’ve been having is that the CPU would TDP throttle at around 70 degrees Celsius. Well, yes, that’s how HDD’s sound, more or less. You can replace the HDD with an SSD if you want something quiet. i cant recommend the ux303! the display broke off after only 1 year of use! support says its my fault so no warranty! i shouldnt have openend it from one side only, the hinge was not designed for that! my thinkpads hinge was, it lasted 5 years with no problems.. then i bought an asus.. mistakes were made.. I have many laptops, this Asus is stunning, you need to upgrade the SSD to the high speed version, fresh install Win 10 and you will get a working day out of the battery together with a laptop that can play the most compressed 1080p film or even render 3DsMax in real time which most desktop i7s struglle with. Laptop and charger runs cold and the big plus point is that the air comes out the rear (and goes up the screen) so if you leave it on your bed, it does not self destruct like all HP laptops! Big Big disadvantage… the hinges on the actual screen are held in by 3 screws (on each side) that are brass insert pressed into plastic with a wall thickness of about 2mm, the hinges themselves are well designed and substantial but the engineering along the display attachment is more reminiscent of Amstrad not Asus. My screen has broke twice, luckily I am an engineer with a workshop that can fabricate anything and I CNC machined two inserts from a piece of solid brass and epoxied them into the wells and so far, seems to have resolved all issues. My conclusion is that if you have a 2000 sq ft shed at the bottom of the garden containing 6 figures worth of precision machinery AND you have retired so you time is free, you will enjoy this laptop! Oh! it is possible to lock this laptop, it gets stuck in half un-hibernate, its not actually bricked just screen dead with all the symptoms, it can be fixed. How did you fix the bricked problem? Mine, suddenly after the anniversary update decides to not shutdown completely or hibernate or sleep completely: the screen is black but the power switch is lit. I have to hold for 10 counts and hard reboot to get it working. I've updated all I could, and reinstalled win 10(everything gone except for asus original files) by going into system reinstall. No change. It's been a half year of frustration as I can't fix it. Any suggestions? And how did you fresh install?